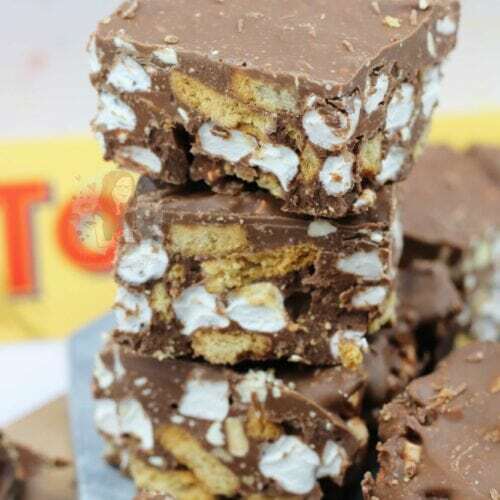 An Easy, and DELICIOUS No-Bake Toblerone Treat with Biscuits, and Marshmallows… Toblerone Rocky Road! 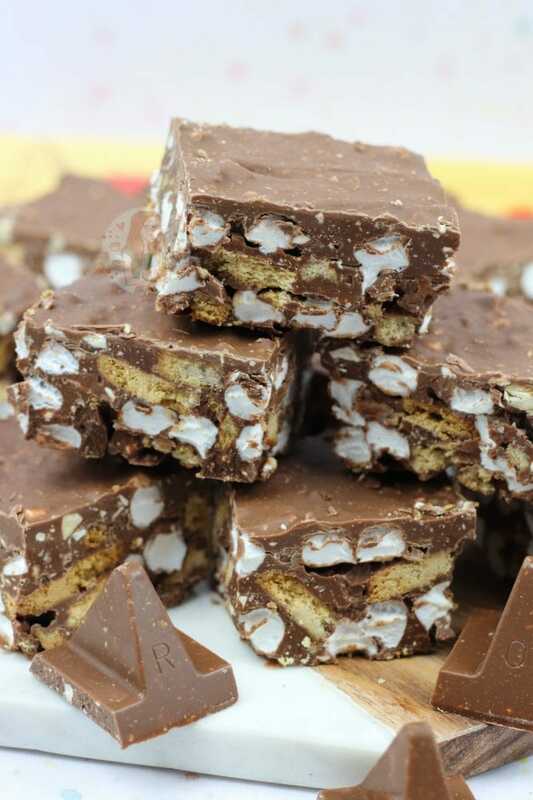 Rocky Road is something that I will always love and adore… no matter what. Yes, it is basically just chocolate, and sugar, but whats so bad about that?! Any flavour you have, any type you have, is DELICIOUS. Honestly, I could easily devour anything like this all the time. Also, they’re always just so incredibly yummy. SO YUMMY. 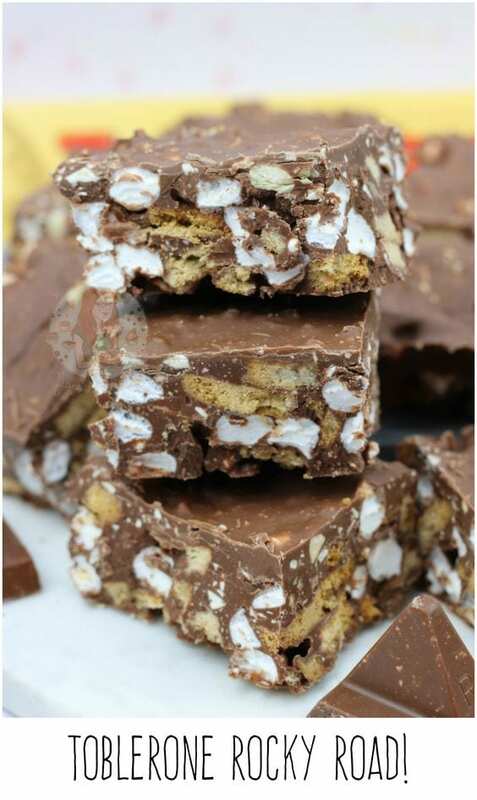 Some of my most popular recipes on my blog are Rocky Roads… such as my Mint Aero Rocky Road and Rolo Rocky Road. 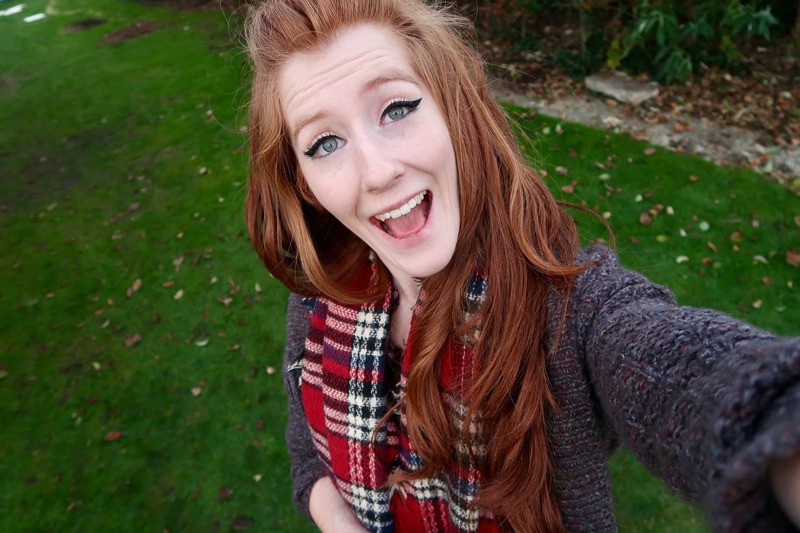 Everyone just loves to make something like this because you can adapt them so easily. This time, as I had basically madly bought 10 Large Toblerones when I found them available for basically £1 each, I thought that I should start using them up. I LOVE Toblerone as its just one of those treats that you can’t resist. 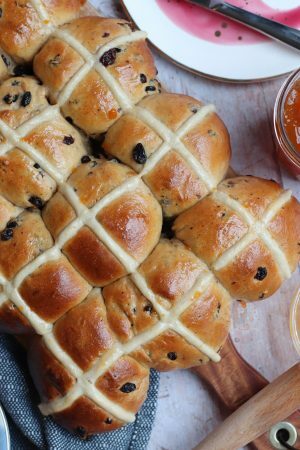 I get its not everyone’s favourite, but often they’re quite a big crowd pleaser! 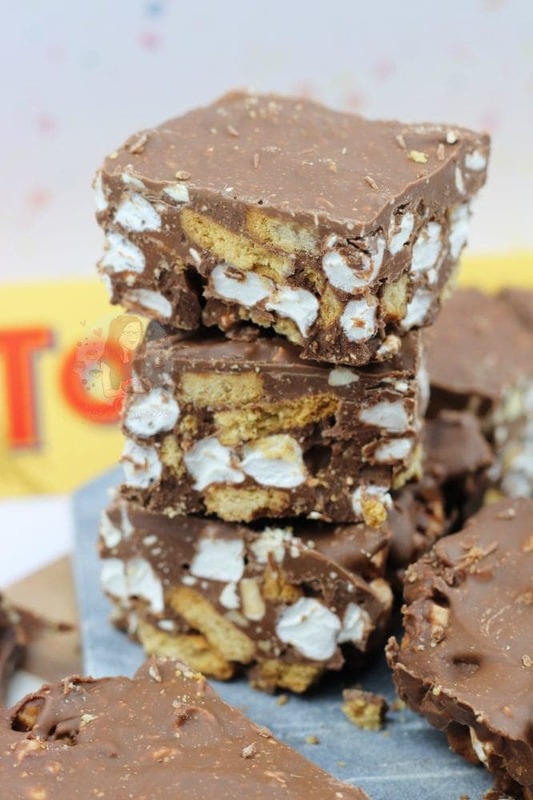 I have quite a few Toblerone Recipes on my blog, but not as many as other sweets so far. My No-Bake Toblerone Cheesecake has always been a hit since its been posted, and my Toblerone Brownies are some of the gooiest and fudgiest ones around, so another Toblerone recipe was needed. 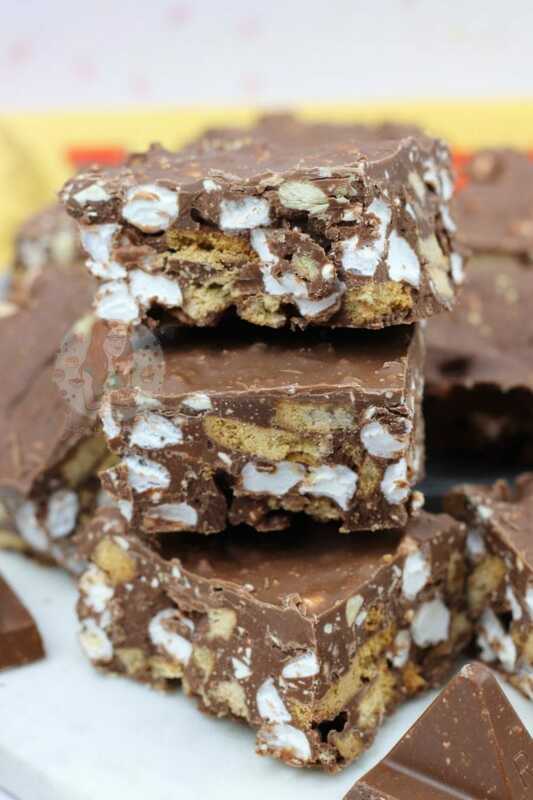 As everyone loves No-Bake Recipes so much, and because its getting to summer and hotter days and not everyone wants to be around an oven all day… I thought Rocky Road was best. And OH MY I am glad I did this. 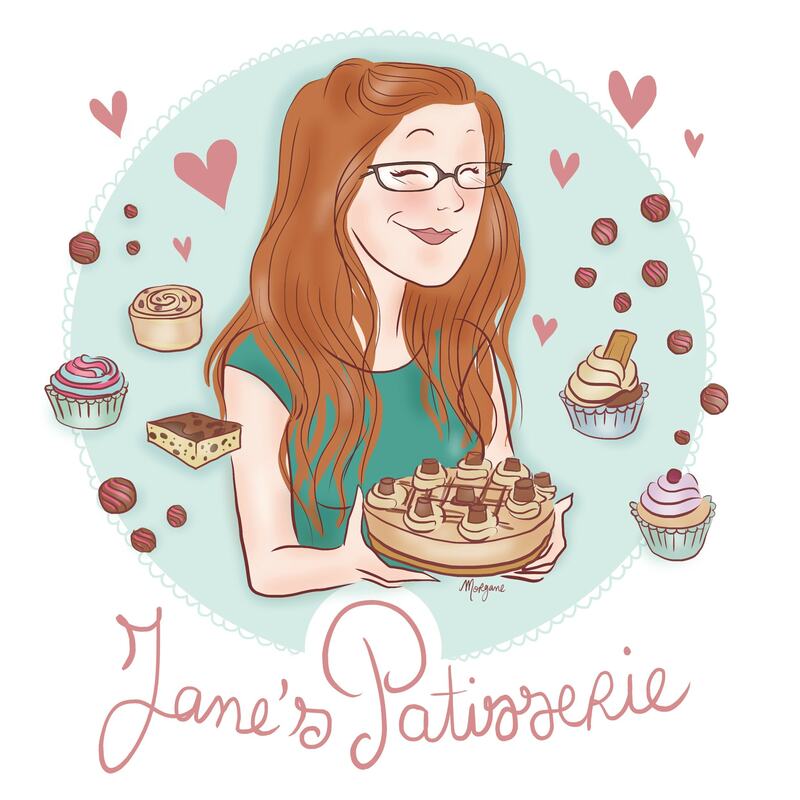 I’ve made probably every single chocolate bar I can think of into a Rocky Road of sorts in my time, but I can’t post them all on my blog at the same time otherwise you guys would get bored… but its been a while. 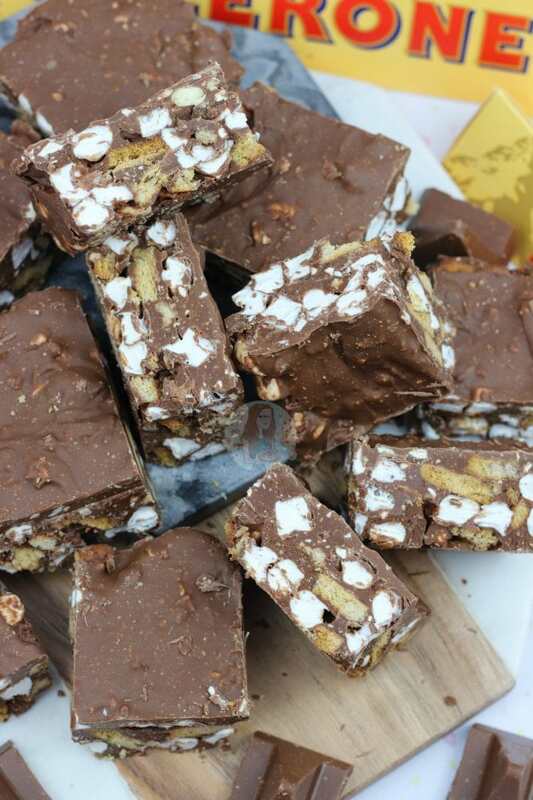 So Toblerone Rocky Road happened! The thing I utterly adore about Toblerone, is just the taste of every single bite. Everything about it is delicious for me. The little nuggets of Nougat that you can see, even when its been melted down. It’s not a heavy chocolate, but its sweet. It’s not overly sweet, but its heavenly. 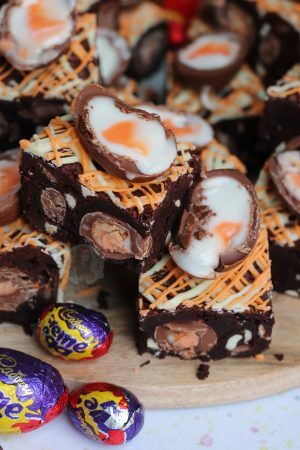 I use one of the large ‘bars’ in this recipe, and then some milk chocolate to top up the chocolate quantity, but it would work just as well with 600g Toblerone on its own! 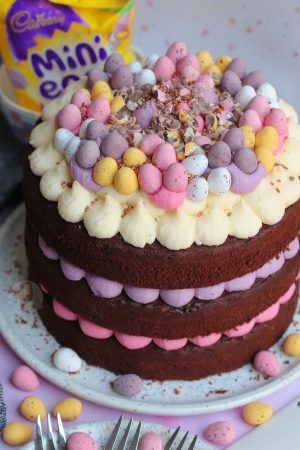 Even though in this recipe I basically just use Chocolate, Digestives and Mini Marshmallows, you can easily add in whatever else you wanted. You could use other biscuits, you could use larger marshmallows, or you could add in ANYTHING else. Nuts, Glace Cherries, other Chocolates, Raisins etc. The recipe ends up being quite similar to my Malteser Tiffin, but without the Maltesers obviously. I realise that this particular traybake does look quite basic, but thats what I like about it. Traybakes are something that I think can win over the crowd the most. Whether is Brownies, Blondies, Cake, or Rocky Roads for example… a traybake will always win. They are just so much easier to do as well! No need to layer anything, no need to bake some of them, nothing. Just basic delicious sweet goodness! 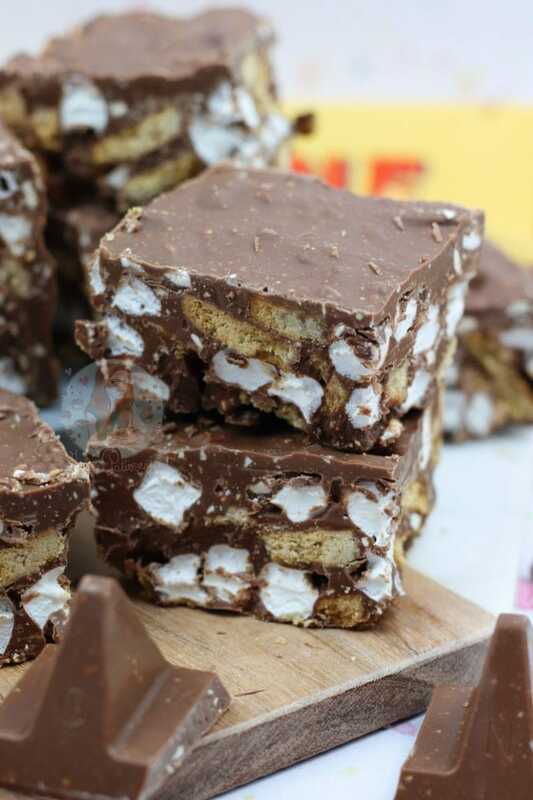 An Easy, and DELICIOUS No-Bake Toblerone Treat with Biscuits, and Marshmallows... Toblerone Rocky Road! Grease and Line a 9x9" or 8x8" Square Tin with Parchment Paper. Leave to the side for now! In a microwaveable bowl, add your Toblerone, and Milk Chocolate and melt on a low heat till melted. You'll want to do 30 second bursts and stir in-between each time! In a large bowl, add your chopped up Digestives, and Mini Marshmallows. Add 75% of the melted chocolate to your Digestives and Mini Marshmallows and fold together. Chill the Rocky Road in the fridge for a couple of hours, and then chop up. Toblerone is a naturally thinner chocolate in comparison to others because of the other ingredients. Because of this I don't often use Butter and Syrup in this mix, but you can if you wish! 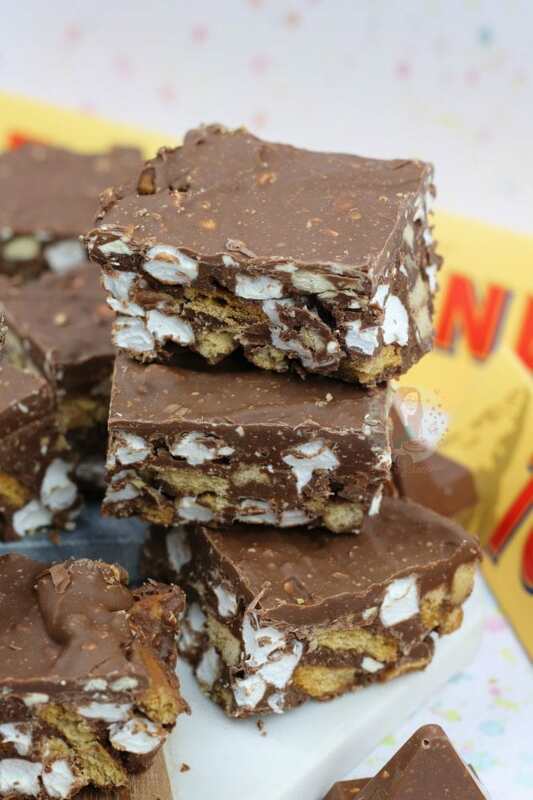 Melt together 100g Golden Syrup, and 100g Butter and mix in with the chocolate like in my other Rocky Road recipes. This will last in the fridge for up to two weeks easily, if it lasts that long! I used one of the large Toblerone Bars which are 360g, and put in the other 250g of milk chocolate to make up a good weight of chocolate. You can use just Toblerone if you wish, but thats up to you! 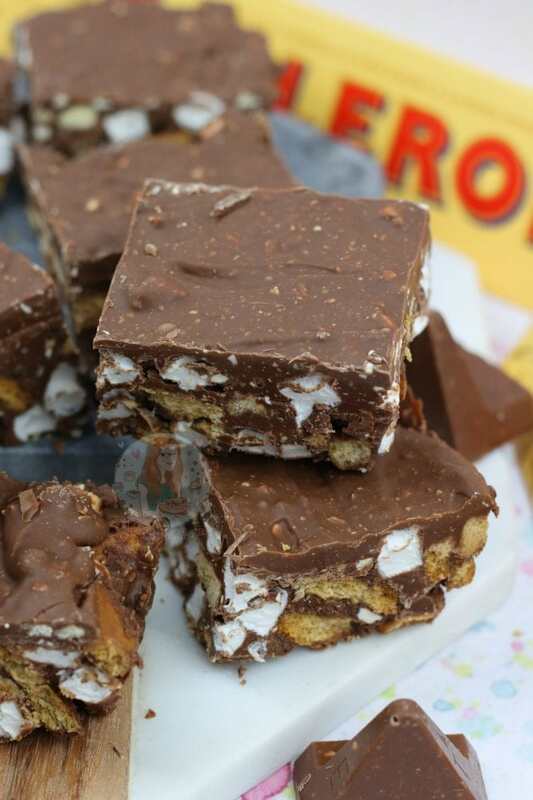 Find my other Toblerone & Rocky Road Recipes on my Recipes Page! Older Next post: Lemon & Blueberry Blondies! 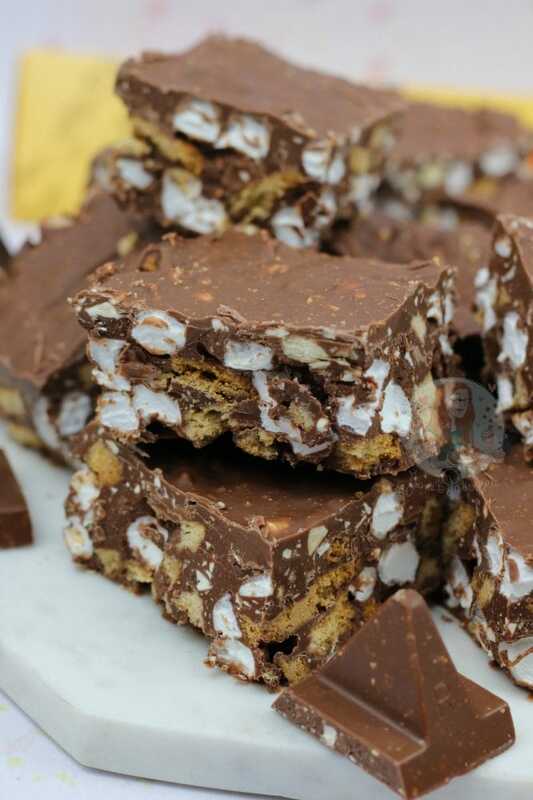 Can I use flake chocolate bars for making rocky road? No – Flakes don’t melt properly! Just use supermarket own milk/dark chocolate! Thank you so much dear.How can I Know if the chocolate I’m using needs adding butter and syrup? Just follow the recipes as they are.